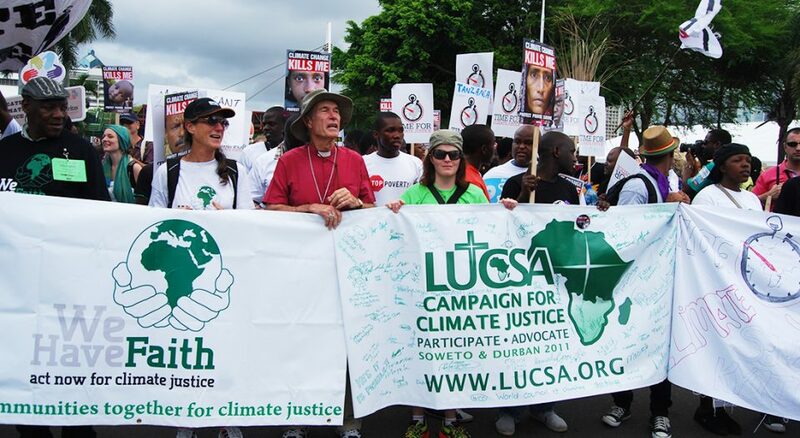 Kristen Opalinski marches with members of the interfaith delegation at COP17 (Conference of Parties, United Nations Climate Conference). Editor’s note: the following is part of a series of articles from ELCA theologians, Rostered Ministers, seminarians/professors and other contributors that feature individual viewpoints on the Reformation’s importance on the occasion of the 500th anniversary. This article reflects the perspectives and thoughts of the author and not necessarily the theological, ethical, or social stances of the Evangelical Lutheran Church in America or Living Lutheran. Kristen took part in the interfaith delegation’s response at the United Nations Climate Change Conference in Durban (COP17) in 2011. 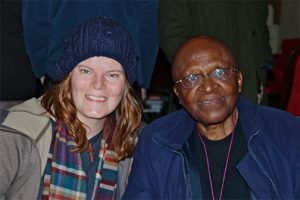 During this time she had the opportunity to dialogue with faith leaders from across the world, including Archbishop Emeritus Desmond Tutu. Lutherans throughout the world gathered this past year to commemorate the 500th anniversary of the Reformation. It’s in moments like these that I believe we have the opportunity to look both inward and outward, finding ourselves drawn to questions surrounding identity and purpose. We ask ourselves questions about our journey as a global Lutheran family: Where have we come from, and what does God have in store for us next? These questions are rooted in both historical and cultural contexts. They are questions that join our theological identity as a church with our individual identities as people – whether in North or South America, Africa, Europe, the Middle East, Asia or the Pacific. For 500 years, our journey of inquiry has been reflected in the liberation we find in Christ, recipients of God’s abundant love and grace, which have been poured out freely for all to receive. As Lutherans, we are bound to the cross, centered in and always returning to Christ. This theology of grace holds together an unimpeded diversity of ideas and cultures because in Christ we are one body with many expressions and communities of faith woven together with a depth and richness that only 500 years of renewal brings. It’s a renewal of understanding, identity and community. It’s also an on-going transformation – one of a global nature and sometimes hard for us, as Lutherans in North America, to see it playing out. As one of the least racially and culturally diverse church bodies in North America, our opportunity is to embrace the rich cultural contexts expressed not only in our companions abroad but also in members of the Lutheran family here in North America. Through this tapestry of identities, we can begin to understand what God is calling us to next, and in this reality, we can begin to more fully articulate God’s promise of a reconciled world. So, what does it mean to be a globally formed follower of Christ? What does it mean to lean into Lutheran heritage with the hopes of magnifying God’s glory rather than repressing it? Let me share a bit of my own journey with these very questions in mind. 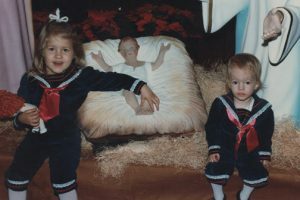 Kristen (right) and her sister Megan pose with the creche at their childhood congregation, Trinity Lutheran Church in Latrobe, PA.
Latrobe, where I grew up, is a small steel town about 40 miles east of Pittsburgh – a predominately white, blue-collar town. While it was a rather insular community, I began to find a global connection through my congregation where my father served as a pastor. Like many ELCA congregations, Trinity worked to be globally informed and engaged. We welcomed any and all who were willing and eager to share their global perspectives with us. Those valuable exchanges helped encourage me to see a much larger picture of God’s work in the world. In the mid-1980s, the congregation established its first endowment, deciding that all income generated would be used for ministry beyond the congregational budget, including supporting ELCA global missionaries and Phebe Hospital in Liberia. I also had the unique privilege of having a family member who had served as a Lutheran missionary – my Great Aunt Ruth, who was a nurse in Liberia in the 1940s. From her I learned a lot about what it means to be bold in one’s faith, including what service and a commitment to the global body of Christ looks like. She was one of the first people in my faith journey through whom I began to see myself. During my undergraduate studies at Augsburg College (now University) in Minneapolis, I was further exposed to an expansive set of ideas and perspectives. Located in the Cedar-Riverside neighborhood of South Minneapolis, one of the most diverse neighborhoods in the city, I was able to experience a community woven together by many different languages, faiths, and cultural contexts. This global formation continued through Augsburg’s Center for Global Education and Experience, during which my final class was a study-abroad course in Namibia. There we studied how education systems and the church functioned within society. This experience transformed me in many ways, but perhaps the most important was how it revealed to me the interconnected nature of the body of Christ and humanity as a whole in more concrete terms. It was the first time I heard the term “ubuntu,” an African philosophy of human connectedness that states that I am who I am through others – that our own humanity is inextricably bound up in the humanity of every person on earth. As I wrapped my head and heart around this perspective of human relationship, my understanding of relationship with God and one another became much more concrete. For the first time, I began to more fully understand what it means to be liberated by God’s grace to love and serve others. Liberation by grace is not an individual freedom but one shared among the entire body of Christ. It propels us to acts of love and selflessness in midst of oppression and injustice in the world. I returned to the United States with a new perspective of what it meant to be a citizen of the world – as a Christian, as a Lutheran, and as a fellow human being. Opalinski is a graduate of Augsburg College (now Augsburg University) and received her master’s in religion from the Lutheran School of Theology at Philadelphia (now United Theological Seminary). As a life-long member of the Evangelical Lutheran Church in America (ELCA) and one of its predecessor bodies, the Lutheran Church in America (LCA). She has traveled and lived abroad in several roles, affording her a global perspective on Christianity and Lutheranism. Currently, she serves as the communications manager for Global Church Sponsorship, Global Mission and the Fund for Leaders at the ELCA churchwide organization in Chicago.